The pop-punk heroes took to the stage after picking up the Global Icon award, and gave new meaning to their politically-charged anthem - switching the lyrics from 'F*** America' to 'Trump America'. Subtle. Telling the crowd he was happy to be out of their home country and away from the chaotic Presidential campaigning, Billie Joe Armstrong said: "It's nice to be out of America just for a second because of this horrendous election that is going on right now, the entire country is about to have one big collective heart attack." 'American Idiot' was originally penned as an anti-George W. Bush statement, though it seems things have far from improved in the eyes of Armstrong and co. The band also performed latest single 'Bang Bang' at the Rotterdam ceremony. 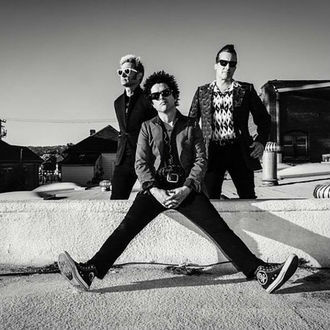 Meanwhile, Green Day have today (November 7) released their new album Revolution Radio. The band will embark on a small tour of the UK in February, and have been announced as Hyde Park's British Summertime Festival headliners.